Diet in the wild: Rabbits, rodents, pacarana, pacas, agouti, young peccaries, monkeys, lesser anteater, iguanas, tree lizards, frogs, crabs, and small turtles. The fur color of the ocelot ranges from yellow to light gray. The dappling of the coat resembles pattern from light passing through brush and then hitting the animal, allowing the ocelot to blend in with its surroundings. The tail ranges from yellow to gray in color and has black rings. Females are generally smaller in size than the males. Ocelots were listed as an endangered species in 1973. 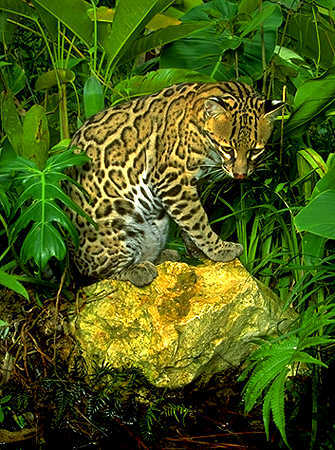 Ocelots can be found throughout Central and South Americas living in both dry and tropical areas. Their U.S. habitat consists of a few Texas counties in the lower Rio Grande valley. In these counties, ocelots can be found in thorny brush areas. These thickets are so dense that humans can only crawl through them. However, their habitat has diminished by 95% due to the development of land for housing projects and freeways. Reduction of the thorny brush allowed for the ocelot to be more vulnerable to predators such as bobcats, coyotes, humans, and others. 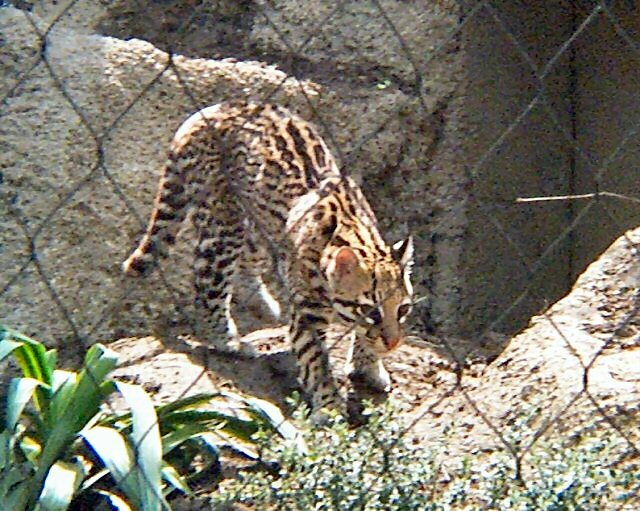 It is due to this industrialization of the land that ocelots have nearly disappeared from the Texas landscape. Today fewer than 120 ocelots are still in the wild in Texas. Prime ocelot birthing months are September, October, and November. The gestation period ranges from 70-90 days and the average litter size is one to two kittens. 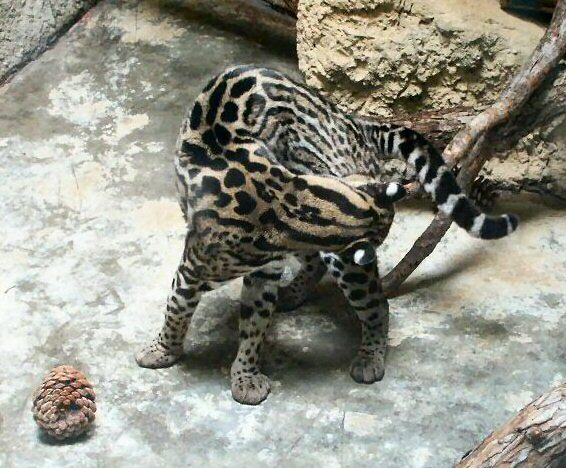 (Sometimes up to four may be in a litter) Litters are born once every two years and the ocelot growth rate is very slow compared to other felines in its family (ex: bobcat).  The den is usually well protected in a dense thicket or brush. The young remain in and around the den for several weeks. Once the young are a few months old, they begin to accompany the mother on hunting trips. When they are old enough, generally several months, the young ocelot detaches from the mother and goes out on its own. From above, the dappling and coloration of the coast allows for the ocelot to be hiden in brush and shrubs away from predators. Being nocturnal in nature, it allows them to hide during the day safely so they may hunt and play at night. Ocelots have retractable claws, like most cats, so that the claws can remain sharp for both seizing and holding prey. They have large eyes with acute binocular vision, and good night vision, which is adapted for hunting. Even though the ocelot's ears are relatively short, their hearing is excellent. When hunting, the ocelot moves quickly and quietly through the brush, stalking its prey until it is right on top of it. Ocasionally, the ocelot stalks its prey in trees, but they do most of their hunting on the ground. Ocelots are strong swimmers, however like most cats, they do not enter the water readily. The habitat of the ocelot at the Fort Worth Zoo is about fifteen feet tall and about fifteen feet wide. It has three levels and consists of rocky ledges and small trees and shrubery. The third and highest level contains the most shrubbery and cover and is where she is most comfortable. She spent the majority of the time lying in brush hidden away from plain view watching her surroundings from her cover. Walker's Mammals of the World. 6th ed. Ronald M. Nowak. Baltimore : Johns Hopkins University Press, 1999. The International Wildlife Encyclopedia. General editors: Maurice Burton and Robert Burton. New York, Marshall Cavendish Corp., 1970.